Green is the new black people! If you're yet to hop onto the "green & lean", "green smoothie brigade", "green living" bandwagon, it isn't too late. Growing up, anything green equaled bitterness, earthiness and general unpleasantness. Of course, like many children I loved broccoli (mini trees!) but everything else was a no go. My Mum would tell me every time we all sat down to eat together that one day I would love my vegetables, especially my greens (all the whilst I shoved peas around my plate with a fork). In my late teens, vegetables were all I would want to eat, and I flipping love my greens! Lots of people still despise the idea of eating a mountain of green vegetables, or wolfing down a big green salad, or even chugging down a green smoothie. Alas, I promise you none of these things taste like a swamp (that's a lie, I did pick up a swamp green smoothie at the weekend that did taste like swamp water with a worrying spicy tickle, but that was a one off!). Green is the colour of goodness, health and wellbeing. It's fresh, it's juicy, it's nutritious and it's delicious. Trust me. You're going to love your greens and there are several easy ways to get greens into your diet! 1. Each week, try a brand new vegetable and try and incorporate it into your diet somehow. Never tried bok choy? Easy, just chuck it in a vibrant stir fry or pan fry with some chilli and garlic alongside some fish and baby new potatoes. Broccoli is great but it's good to try new things, you never know what wonders you may discover! 2. It wouldn't be a green related post without a green smoothie recipe. I know, boring, but if you're yet to discover the wondrous world of green smoothies, now's the time to start. My current favourite is one from Madeleine Shaw's latest book (I told you in my last post you'd never hear the back end of this book!). Simply blend a handful of washed spinach, a handful of pineapple chunks, one whole lime, 2 tbsp almond butter and some fresh mint leaves, all topped with water. It's so creamy but so fresh! My other personal favourites are a handful of kale/spinach, 1 green apple, 1/2 kiwi, 1tbsp ground flaxseed, 1/2 lemon/lime, mint, topped up with water or coconut water (so basically very similar to the above recipe, but super juicy!). If I need something a little more substantial that will give me plenty of energy, I love my smoothie from my 1, 2, 3 - Grab and Go Smoothie. Just play about with ingredients, or head to Pinterest for inspiration - your ultimate green smoothie is out there somewhere! 3. Once you've mastered your favourite green smoothie, why not move on to the green cocktail? Ok, so this may not be the healthiest option but I'm all about the balance and if you can combine a green smoothie and all the nutrients it brings, and top it off with a smidge of alcohol, why not? Once you've made your smoothie, pour it through a sieve into a jug underneath. Then pour into little tumblers or cocktail glasses, add a shot (or two, whey!) of your favourite clear spirit such as Rum or Gin, stir and garnish with mint leaves. Even the most anti-green person will love this. - drizzle over some dressing such as a vinaigrette (extra virgin olive oil & balsamic vinegar/lemon juice OR any combination of fat and vinegar) OR make a creamy dressing - why not make your salad even greener with a creamy, zesty avocado dressing? 5. Add greens to absolutely everything. Making a bacon sandwich? Why not use mashed avocado as your 'butter' - it's arguably tastier! Making tacos or fajitas? Serve up a bowl of shredded, crisp iceberg lettuce. Throw in extra greens into your stir fry such as tender stem broccoli and spring greens. Whatever you make - add your greens! 6. Now these bad boys are something I'm going to need a regular supply of as they are arguable the easiest way of getting in your greens. VITL Greens* are little sachets of green goodness that you can add to water, smoothies, 'nice cream' - anything! They have a really lovely fruity taste, unlike so many other green powders. When added to water it's just like having a tropical juice so no need to disguise in an abundance of natural sweeteners and other ingredients. 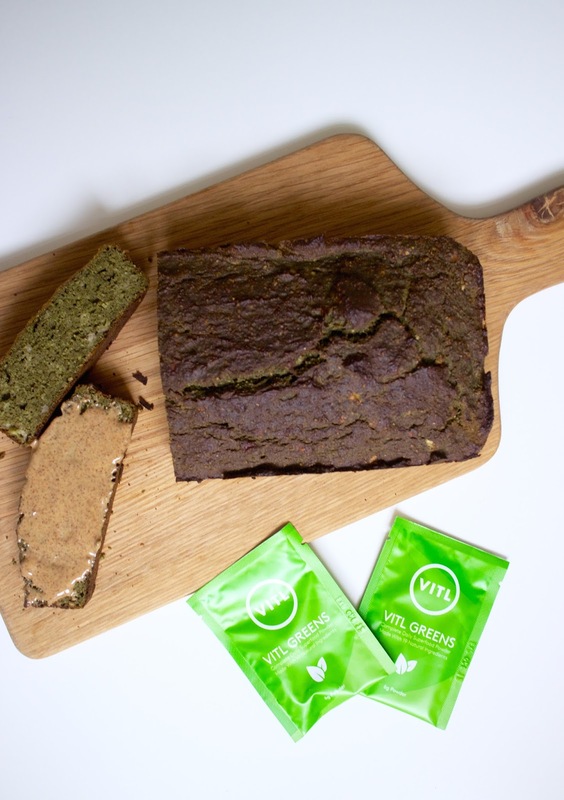 I received a gorgeous green package from VITL to make a natural, easy peasy green banana bread. I love a warmed up slice with almond butter smeared on top - the perfect mid afternoon pick me up! Simply mash the bananas and mix with the eggs in one bowl. Stir all of the dry ingredients in another bowl. Combine the wet ingredients into the dry until well mixed. Pour the mixture into a greased and lined loaf tin and cook on 180 degrees for 40-45 minutes. How do you make your life green? What's your favourite green vegetable? Have you tried the VITL Greens?